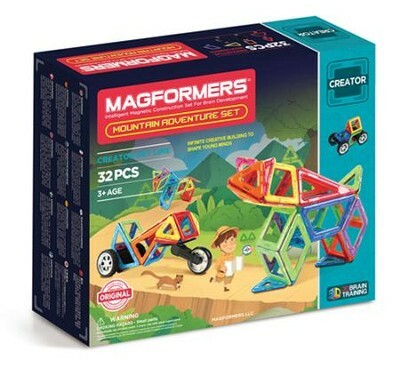 Journey across the Rockies with the Magformers® Adventure Mountain 32 Piece Set. Create several different mountain animals like bears, wolves and tigers. Go off-road as you add new Mountain wheels to create different SUVs. Transform your vehicles to tricycles as you add new bike wheel accessories, the building possibilities are endless. This set contains pieces of 5 different geometric shapes in different colors. When playtime is over, use the magnetic power to simply stack and store for easy clean up! Recommended for children ages 3 and up, this set is made with BPA free plastic, and is compatible with all Magformers® shapes and accessories. A fun toy for S.T.E.M learning. I'm the author/artist and I want to review Adventure Mountain, 32 Piece Set.